You really have to appreciate it when the VP of the company I work for tells you they are closing the office at noon on Good Friday. Especially when your car is packed and ready to head north. I didn’t have to be told twice and a few minutes later I was on the highway and headed to my Mom’s place in Oscoda. Since I was arriving so early I was hoping to get her to-do list done toady and go steelhead fishing the next morning. For once everything worked out like I wanted and I was all clear to fish the following day. I awoke the next morning bright and early, around 8:30 am. I got all my gear together and made the short drive over to the AuSable river. Along the way I spotted a female woodcock doing the “timberdoodle two-step” across King’s Corner road so I stopped to watch her for a bit. Turns out a lot of critters were out and about this morning. 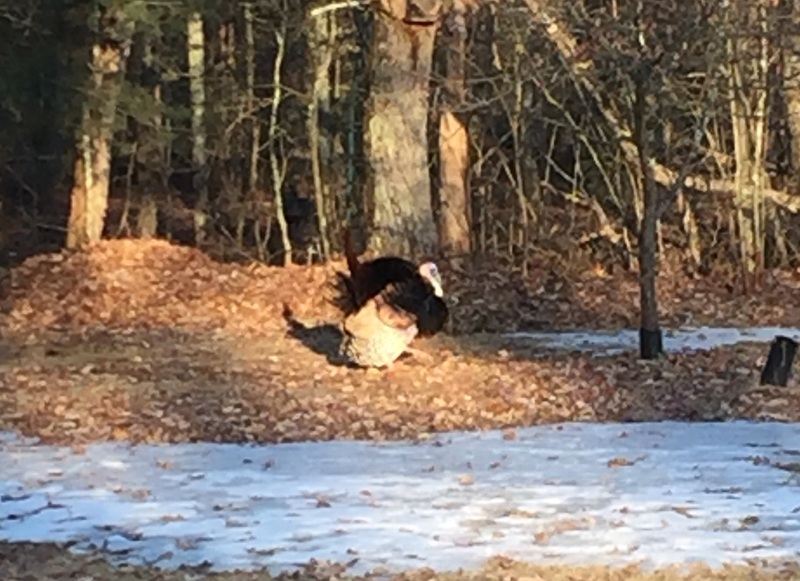 I saw plenty of deer and sandhill cranes in the fields getting a late morning meal, And one turkey that had something else on his mind. I arrived at the parking lot around 9:00 am and got set up. I was expecting a lot of vehicles with it being the weekend and I was surprised to see only one truck. I wasn’t going to complain but I couldn’t help but wonder if it was a sign that there weren’t any fish around. Once I got to the river I spotted the truck owner, a Father and Son spending the morning together. I talked to the Father for a few minutes, they caught one small steelhead further upstream and a sucker a couple of minutes ago. I asked which way they were headed and then I went in the opposite direction. Once I got about 100 yards away from them I waded in and started swinging a black/purple Senyo A.I. 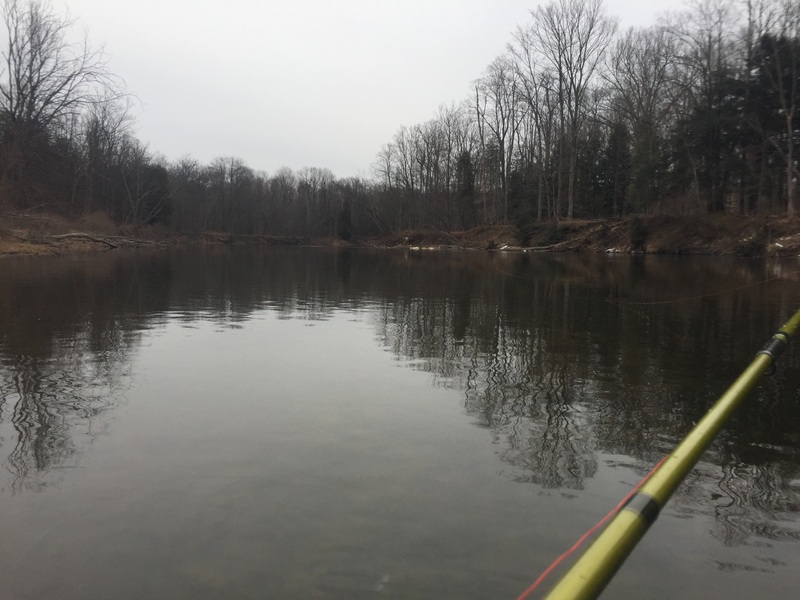 I was also using my Sage “Pulse” 8wt rod today. I have a feeling this is going to be the rod I use the most in Alaska so I wanted to spend as much casting time with it that I can. I started going through my usual routine. Cast, mend, take two steps downstream. I kept trying to land the fly at an angle along the seam on the opposite side of the river. I was standing in an area where the current shifts from the north side to the south. I was hoping a fish would be lying on the opposite side and be pissed off enough that he would crush my fly. No such luck. Eventually the two fishermen I saw earlier had left so I continued to work my way downstream. A River all to myself. After about an hour I waded out and decided to switch flies (Pink Predator Scandi) and put on a heavier MOW tip. I was running a T-11 2.5 float/7.5 sink and I changed over to a T-14. I really have no idea how deep the water is on the other side but since I wasn’t hitting bottom I knew I wasn’t getting deep enough. Even though the water is very clear I don’t expect the fish to chase a fly to much in this cold water. I gave that set up a swing for about half an hour to no avail as well. I had some more time before the wind advisory was supposed to go into affect (possible 45 mph winds) so I decide to go on a walk-a-bout and see what I could find downstream. There is plenty of fishable water, it’s just a matter of getting to it and no one else being there. 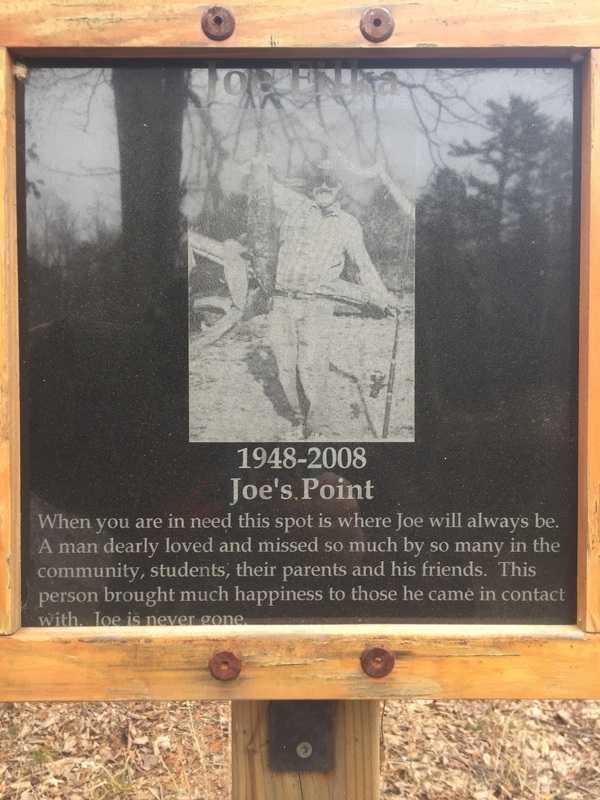 Eventually I ended up at a spot called “Joe’s Point”. It is across the river from a very popular area and once again no one was around. I went back to casting but once again I didn’t have any luck. I didn’t see any fish on the gravel either. Still, it was a near perfect day. Overcast skies, no wind (yet) and nature was definitely active. Mallards and Woodducks were making all kinds of noise along with the occasional Kingfisher. As I was walking out I bumped another Woodcock. He’s probably thinking he should have stayed south a little bit longer this year. I was thinking I should have stayed in bed longer as well. Oh well, there will be another time. Don’t know if I will be able to get back up here again though. I may have time for a trip to the Alley for a day but I don’t know about a run north. Guess it depends how ambitious I get. On my way home Sunday I did stop at Omer to see how the sucker run was going. I had stopped on the way up and their were a few fishermen catching suckers. The trip home was a different story. The cold front was keeping people indoors and I wasn’t seeing any fish being caught. I’m sure Monday will be a different story, no wind and warmer temps. Until the next front comes through. Crow hunting the easy way. 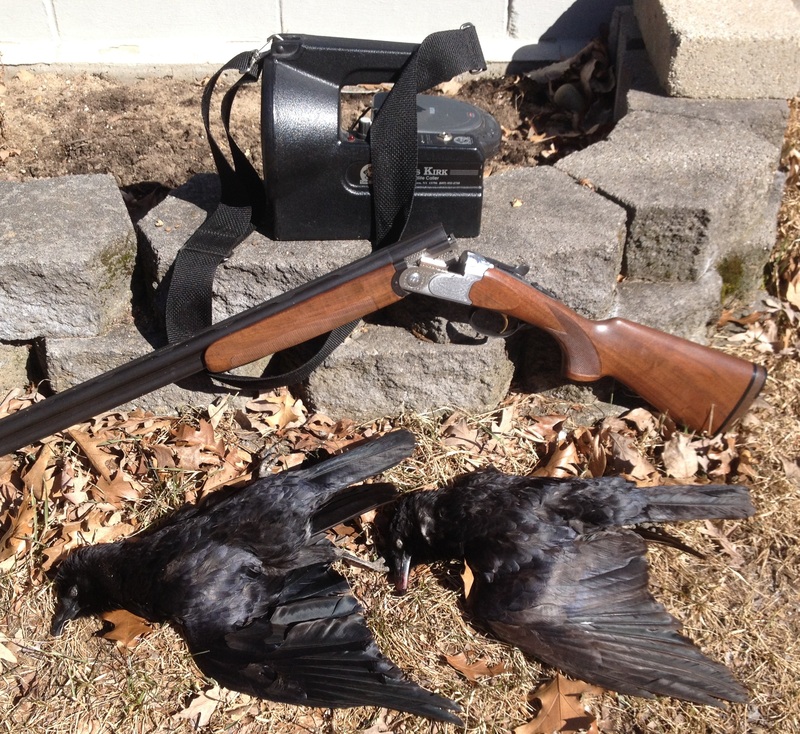 Crow hunting has to be the easiest, most relaxing type of hunting I know. I get to sit in my parents living room and watch fishing shows until I hear the sound of a crow in the distance. Once I do I put on my coat, grab my shotgun and caller and walk across the street which, is state land. After about a 200 yard walk I load the shotgun, turn on the caller, hide in some bushes and start shooting about 10 seconds later. It’s just that easy. To be fair though I do have an ideal set up. My parents live on a dead end street in northern Oscoda near Van Etten lake. The north end of the lake is surrounded by huge pines that the crows roost in overnight and generally hang out at all day long. Across the street is state land that was lumbered out a few years back. It was never re-planted so there are a lot of small oak and pine trees popping up all around it. This has resulted in lots of small clumps of trees and bushes that make excellent cover. A two track runs right through the middle which makes for easy walking. All I have to do is hide in a clump of short trees, turn on the crow distress cd (yeah a CD, not a pre-programmed caller) and wait. Usually it doesn’t take long, they don’t have far to fly. The only draw back is that it is usually a very quick hunt, like less than a minute. Sometimes I get lucky and a straggler will come in a few minutes later but for the most part it is done pretty quick. Once I’m done shooting I pick up my birds and stuff and walk back to the house and go back to watching fishing shows. Every September my friends and I get together for a long weekend of Hunting and Fishing. We have been doing this for almost 30 years now. The game has changed over the years but the outcome is always the same. A guy’s weekend where if the season is open we are going after it. This time of year it’s all small game. First on the list is squirrel followed by Grouse and Woodcock. We don’t do as much bird hunting anymore since none of us have a dog. We still get a few birds here and there but without a lab or setter it just ins’t the same. Saturday morning started out very foggy so while we waited for the fog to burn off some we got in a little crappie fishing. 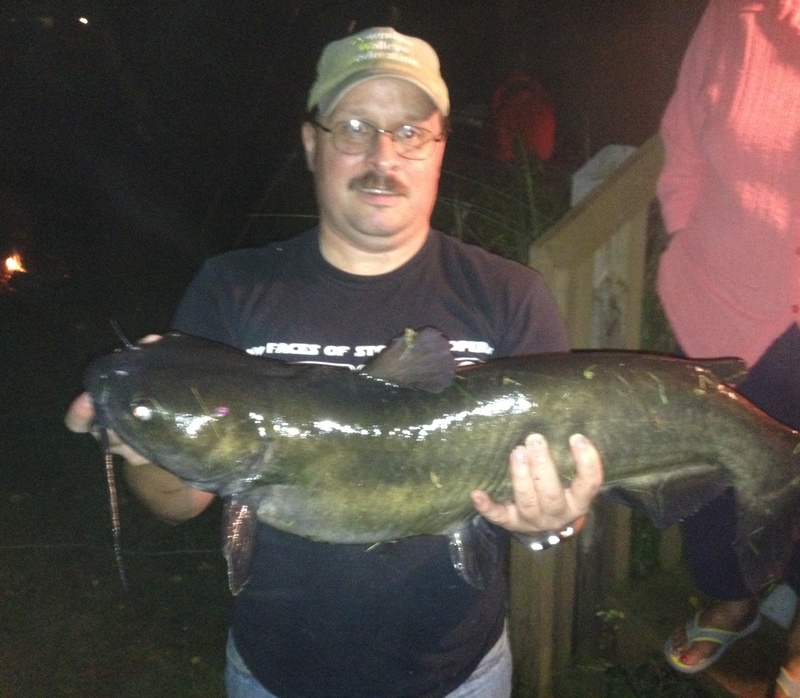 Barry has been creating fish structures off his Mom’s dock and it is starting to pay off. In less than an hour we managed to get 10 crappie for a fish fry later. The fish turned off rather quickly but no matter, the fog was lifting so it was time to shoot a few squirrels. We grabbed the .22’s and headed to a stand of oaks not to far down the road. Barry headed south and I headed east. Dean was doing something else so I don’t know where he ended up. I was glad to see that the long winter didn’t affect the acron crop. If anything it helped, they were everywhere. I can’t remember the last time the crop was this good. An abundance of acorns usually means an abundance of squirrels. I saw a fair share of them that morning and was able to connect on two. 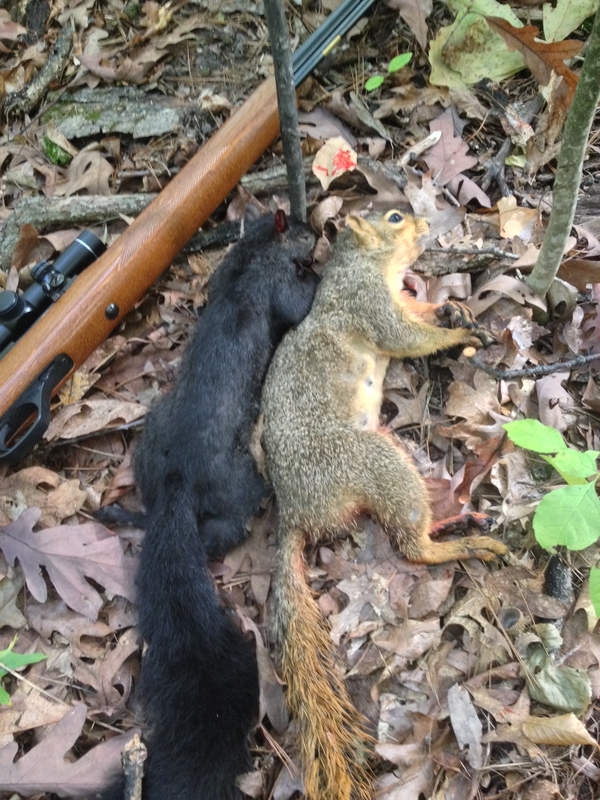 If I carried my shotgun I’m sure I would have filled my 5 squirrel limit but I like using my Marlin Model 60. 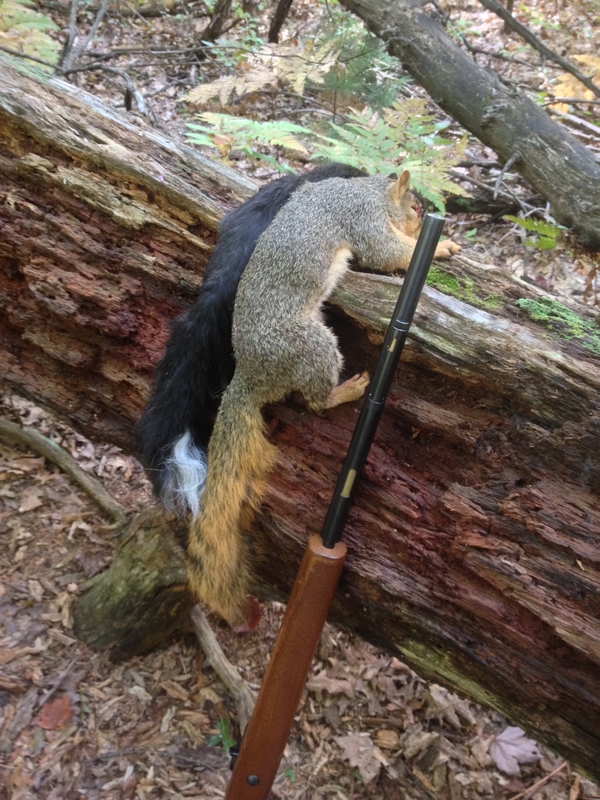 It is a lttle more challenging to hit a squirrel with a .22 but at least I don’t have to pick shot out of the meat. The drawback though is that since I have started using bi-focals trying to spot squirrels in the tree tops and then focusing through the scope is a little more difficult. I told myself that I would get a new scope this summer but I never got around to it. I paid the price for my procrastination later that day when I missed 3 easy shots. We could have stayed out a little longer but there was a group training search and rescue dogs using the area so we decided to stay out of their way. We had other things to keep us occupied, like fishing. Day 2 started out the same as day 1, foggy. We tried fishing again but no luck. It was like they just shut down. Later that day we talked to a few other anglers and they reported the same thing. Barry and I gave up after about 30 minutes and went squirrel hunting again. We managed 3 this morning and we checked out our opening day wood duck spot. With all the acorns we figured their would be a lot of wood ducks in our usual area. We had to change things up some since we no longer have a dog for retrieval duties. Had to make sure I could get the kayak back in our spot. It’s looking good since we jumped about 30 or 40 woodies from the area. Hope they stick around until the opener on Oct. 4th. Around noon I packed up and headed to Oscoda to spend some time with my parents. I got there just in time for a dinner of the perch my Dad and I caught earlier this summer. Once that was done I drove over to one of my grouse and woodcock thickets to see if I could find a few birds. As usual the cover was thick and the warm, humid day made for rough walking. It seems like I was stopping every other minute to wipe the sweat off my face and glasses. I managed to put up 3 woodcock and 1 grouse. I never got a shot at the grouse but I did connect on one of the woodcock. Problem was I connected to well. It was what I like to call a dead on impact hit. I couldn’t have hit this bird any more square with my shot pattern. Some people would say that I should have let him get out a little farther but in prime woodcock cover you don’t always get that chance. 10 more feet and the bird can disappear. After that I found my trail out and walked back to the car. On the way though I decided to walk across the nearby creek to see how well a clear cut grew back in. The US forestry service Cut this area back in the 90’s and it never really took off like I hoped it would. Lots of dry summers kept the aspen from growing like it should. Well it finally came in and it looks pretty good. I took a quick walk through and managed to put up another woodcock. This are should be full of them come migration time. Fingers crossed. The next morning I was back chasing squirrels again. This time I was in a new area I discovered during one of my kayak/bass trips down the AuSable. It is part of an ORV/Snowmobile trail system so that meant lots of easy walking through the oaks. Not as many acorns as in Sanford but still plenty to go around. I saw many squirrels but due to my own laziness I scared more than I shot at. Most of them were on the ground and I would walk right up on them and by then it was to late. Again if I had my shotgun it would have been a different story. I did managed to tag a few and I spent a lot of time walking around the area to get a good idea of how much huntable land there was. I’ll be back here throughout the season. After lunch My dad and I took the .22 pistols down the hill to go plinking. I managed to pick up a few bricks of ammo so now we can actually shoot his Colt Woodsman and my Beretta Model 71. Once we were done with that we took a walk through the nearby oak trees to see if there were any squirrels about. I managed to shoot a grey right away and missed a black in the same tree. After that it was like they all disappeared. I soon found out why. The wind had shifted and we had a storm coming in. The wind started gusting to over 20 mph and it sounded like hail with all the acorns coming down. We got out of the woods and under cover just as the rain started to come down, which it did on and off for the rest of the night. So much for salmon fishing this evening. The next morning I woke up to drizzle, a north wind and temps that were 30 degrees below yesterday’s temp. I decided to pack my stuff and head for home. I did swing back towards my new squirrel spot and walked around for about an hour. I manged to get one more black squirrel before calling it a day. I took some of the back roads home and stopped at a few gun shops along the way. I did find a new 3×9 32 mm scope for the .22 so hopefully my miss rate will drop drastically. Providing I get it sighted in soon. If not I can always do it after the opening morning duck hunt. So for my long weekend I ended up with a bunch of squirrels, a few crappie, 1 master anlger Channel Cat and 1 decimated woodcock. Not bad considering how hot it still is. Not too much fun trying to hunt while swatting mosquitoes and wiping sweat off my glasses at the same time. Hopefully the duck opener is a little cooler. Squirrels are getting freaky with skunks. Zoom in and try to count all the feathers. This is it, the month I have been waiting for. All my preparations are finally going to come into play. The all out assault can begin. Oh wait, that was last year. Fast forward to 2014 and the never ending winter. This one has been so bad that I can’t even tell my kids that I used to have winters like this all the time when I was their age. Not anymore. The last time we received this much snow was during the winter of 1880/81. That’s right, over 130 years ago. To top it all off the Great Lakes are nearing 100% ice cover. This has never happened in my lifetime and probably never will again. The latest 10 day forecast shows a couple of days just above freezing but the nights will still be in the teens and 20’s. All this means is that I won’t even get the boat in the water until the end of April. I’m beginning to wonder if the lakes in northern michigan will be ice free by the trout/walleye/pike/muskie opener on April 26th. Once things do break up I will be in full attack mode. That means fishing new areas and using techniques I don’t normally use. Normally handlining doesn’t start to heat up until the surface temps get above 40 degrees. That could be the beginning of May at this rate. In the mean time I may have to do some jigging to put some fresh fish in the freezer. Early on it is more snagging than actually jigging but the alternative is doing nothing. Once temps creep into the right zone than it will be a steady dose of Rapala’s in various sizes and colors until those other things show up. Then it will be Pencil Plugs at night and weekend trips to the St. Clair river. I might even throw in a early trip to Sanilac, Lexington or Oscoda to see if I can catch any Atlantic Salmon. If not it will be a full court press on the walleye. This summer will be that same thing. Come July my weekend excursions will be lots of trips to Amherstburg to pull wire when the weeds and wind cooperate. If not then it will be Bottom Bouncers or jigging in the same area. The fish are there all summer it’s just a matter of getting the right presentation to make them hit. Normally all I will do is pull wire but when the weeds are bad it will be Bottom Bouncers or jigs. It’s a lot easier to deal with the floating weeds moving with them instead of against them. Hopefully I will be able to use some of my owed favors for a trip or two on Lake Erie. I usually make one trip a year but the last few have proven to be very daunting. Engine problems, rough water, horrendous weed conditions and a lack of fish have made the trips more trouble than they are worth. I know some people say it’s just good to be on the water but I won’t say that. Getting bounced around a boat while constantly clearing lines for weeds while catching dinky white perch is not my idea of a good time. I’ll stay home and go to Plan B.
I’m starting to feel like those people on Alaska The Last Frontier. Got to fill the freezer before winter sets in. Winter isn’t even over and already I am planning on how to fill the freezer. I never realized just how much I miss having fresh fish. I pulled some walleye out the other night and part of it was freezer burned. I still ate it but it wasn’t quite as good as what I am used too. I may have to start keeping a few steelhead, salmon and bluegills to help stretch out the fish diet. Oh well, it will start soon enough. As for now I will still plot, plan, scheme, dream, swear, complain, beg, pray and anything else I can think of until I finally hit the water. I spent this past weekend up at my parents place in Oscoda. I used to go up there on a regular basis but 4.00 dollars a gallon for gas kept me at home more than I wanted. My brother and his wife were also planning on coming up and they wanted to go fishing. 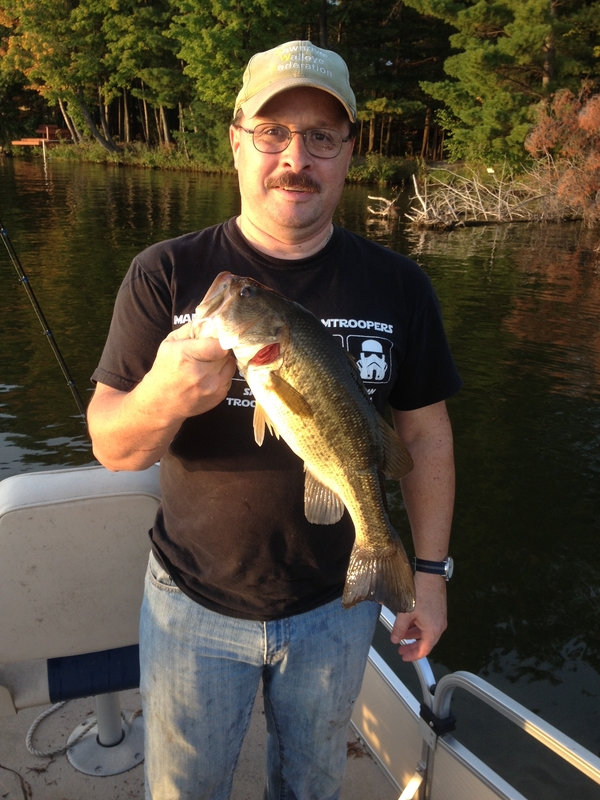 Not a problem, my Dad had wanted to go perch fishing on Van Etten Lake so this seemed like a good opportunity. After a breakfast of homemade waffles Dad and I got the boat ready. I don’t fish for panfish too much so I had to do some digging for the proper tackle. #11 Rapala’s aren’t exactly the best thing for perch, though it would be interesting to see the perch that would grab one. A few minutes later I had everything I needed and we were on our way. A friend of my Dad’s had caught a bunch of big red ear sunfish earlier in the lake so we were off to try and find the same spot. Of course we never found it. We were slowly trolling around trying to find a drop off from 5 to 8 feet of water. I had one rod rigged up with a sinker and baited hook and I was dropping it in until we found some fish. 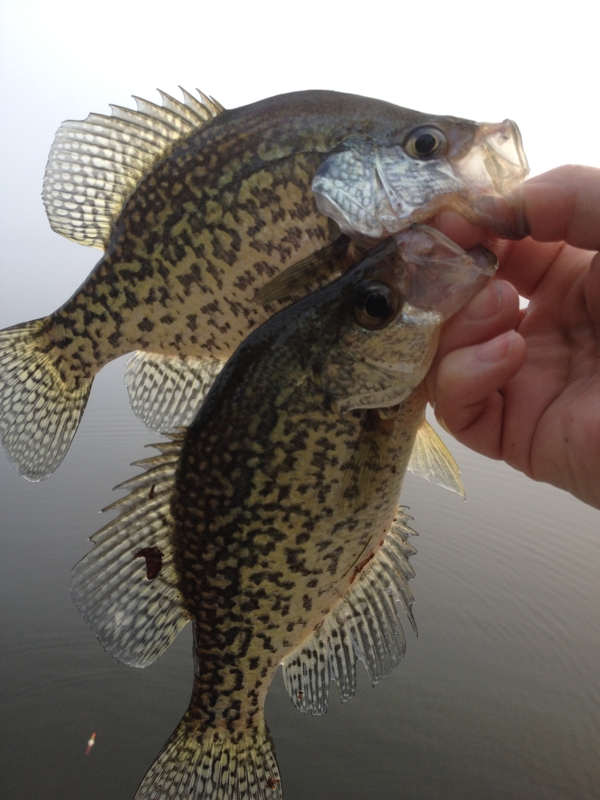 I picked one perch and then another so we dropped anchor and got after them. I was using my sister-in-laws rod so I handed that back to her and got my brother set up. Soon everyone was catching fish but me. I had yet to get my rod set up. I was going to experiment. I really hate using bait, especially worms like everyone else was using. 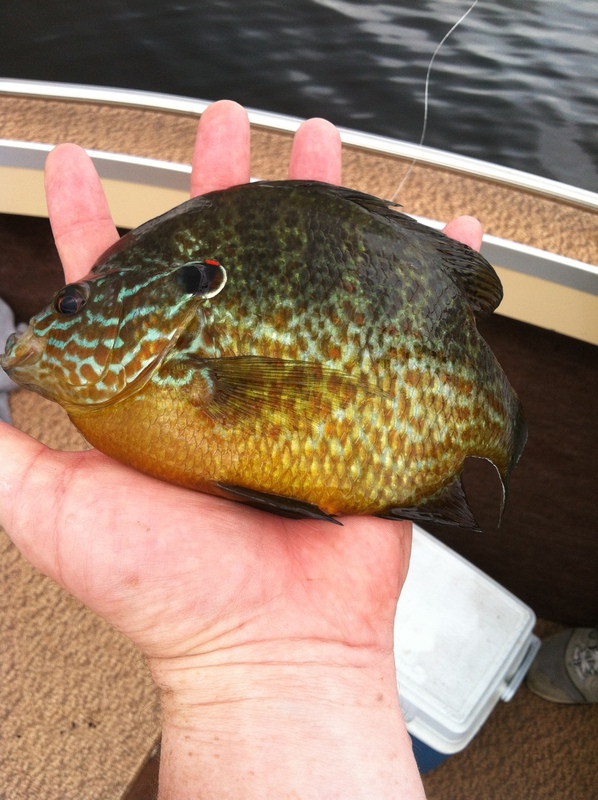 I had been following another blog (D & B Ice Adventures) about a guy who fishes for panfish in Vermont A LOT. He and his fishing buddies use a lot of small artificial jigs so I was going to give it a shot. I was hoping this would work because it would be a lot easier and cleaner. It did. I dropped down a small chartreuse jig with a white plastic body and a few seconds later I was bringing in my first perch. This was great, the water was clear enough that I could see my white jig. The second it disappeared, set the hook and bring in the fish. This went on for about the next hour. Eventually the bite started to slow down so we started to move around to find another active group. We tried a few more spots but with no luck. We had a fair amount of fish and it was past lunch so we headed in. We had other things to do today and the skies were starting to look a little menacing. 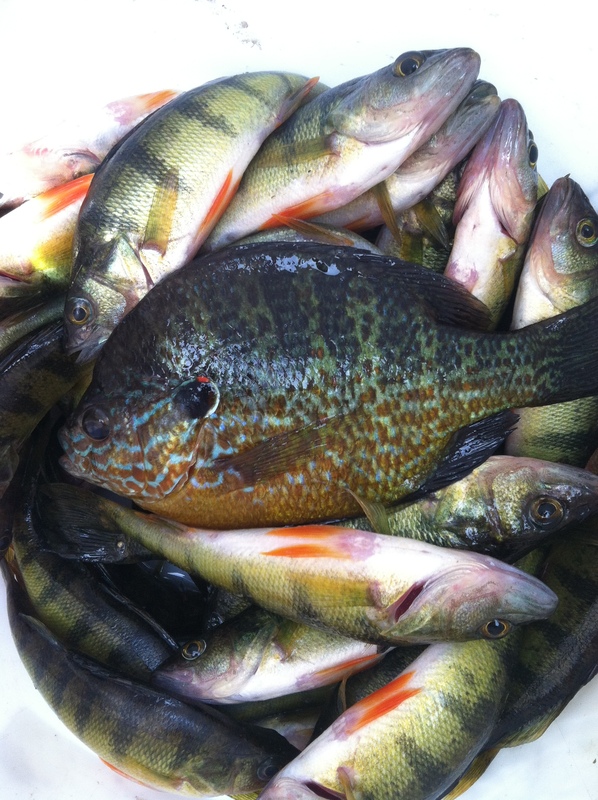 50 perch and 1 big red ear sunfish was nothing to complain about. All that was left now was to drop them off at Wellman’s for cleaning. Which, by the way, they scaled and filleted for 10 dollars. I will gladly pay that if I can keep from cleaning panfish. Now for the vital stats. Water was clear with about 5 feet of visibility. We were fishing in 5 feet of water near a drop off to 8 feet. 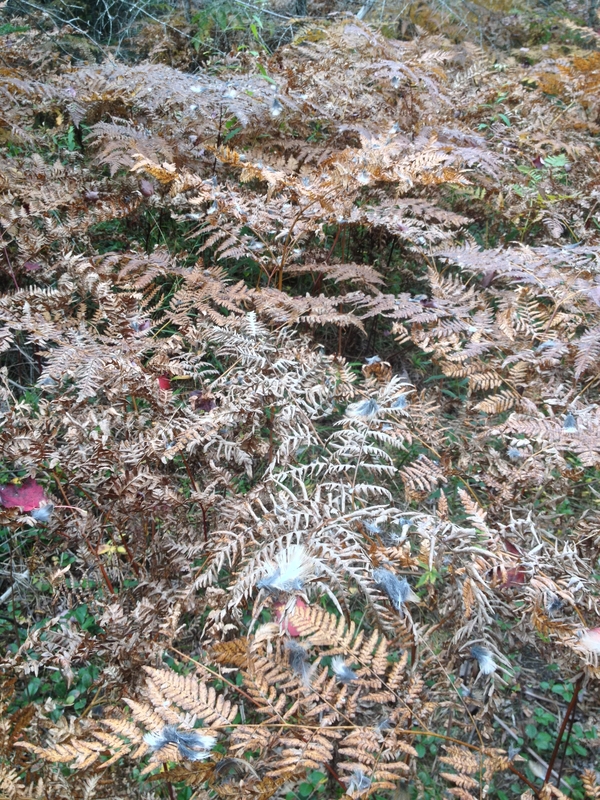 Weeds were kind of sparse and a few bare patches here in there. There was a light wind out of the SE and it was overcast. Everyone else was using a #6 gold plated hook baited with a leaf worm tied above a bell sinker. 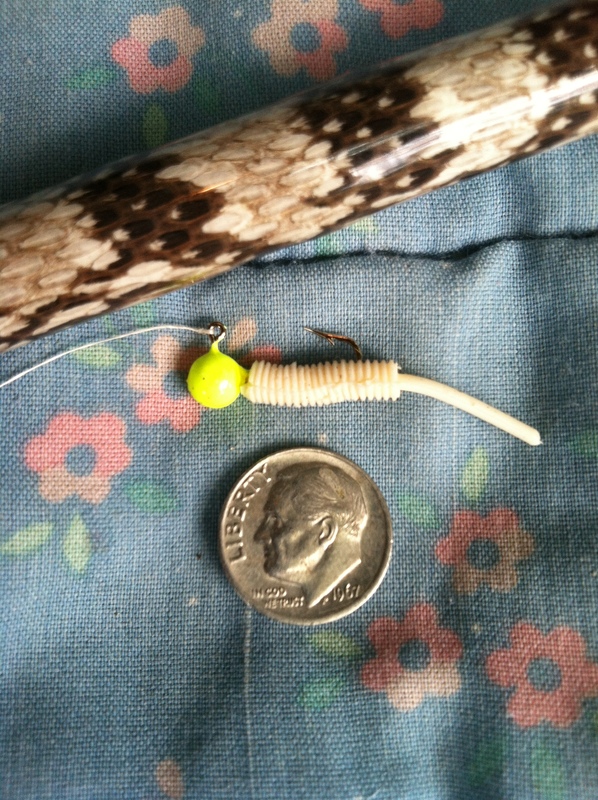 I was using a small chartreuse jig with a soft body bait (pictured below). I would twitch it and bounce it around to keep the perch interested. They would grab it as it was going up, down and even just sitting there. All in all it wasn’t a bad way to spend a morning.